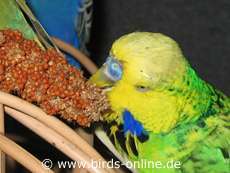 Many pet birds love millet sprays. In most pet shops in Germany one can buy the yellow sort, the red sort is much harder to find. Just a few special shops offer the red sort that is the favourite food of my budgies. Not only the colour is different: In general, the red millet sprays are more expensive than the yellow ones. If you want to buy millet sprays you should also consider from where they are. For example in China yellow millet sprays are grown. Since there are very large plantations the plants have to be protected from pests like aphids or caterpillars. So possibly the people who are in charge use pesticides to controll these pests. Therefore it cannot be excluded that some millet sprays might be contaminated with pesticide residues. You can avoid this risk by buying organic millet sprays. Eating too many millet sprays can lead to overweight. 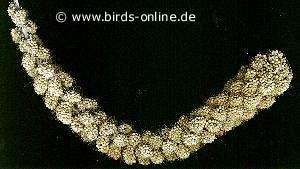 Many birds tend to eat as much millet as they can get. So if you don't rationalize this food your birds might gain extra weight from it. You should not serve it more often than once or twice per week - and only in small portions. Tip: Let your birds eat their seed mixture and fresh food such as vegetables and fruits at first. As soon as they're quite full, you can offer them a small quantity of millet sprays. So they won't eat too much then. Many birds prefer the red sort of millet sprays. All sorts of millet can be sprouted before you serve them to your birds. Please note that many birds need some time to get used to wet food. For sprouting millet sprays, you first should wash them under running water. Then you have to let them soak for about three to five hours. During this time, the millet must be covered with water all over. Wash the millet again after those three hours and let it sprout in a warm and humid place for 24 to 36 hours. It is advisable to turn and wash it several times during this period. Right before serving it, the millet should be washed again and you should carefully have a look for mold on the millet sprays. If you find mold, please do not offer the millet to your birds. You should throw it away instad to be on the safe side.